Stylised images of bees, many of which are indiscernible to the pedestrian eye, have symbolised goddesses for tens of thousands of years. One quite famous image that many believe symbolises a bee, albeit a more modern image than the famous goddess statues from pre-history, is the fleur-de-lis. As tantalising as this association may be, I’ve always felt that it lacked sufficient visual evidence. However, I recently came across an intriguing family crest in southern Germany, which may begin to change my opinion on the matter. Before examining the find, I would like to review another iconic image that has received somewhat greater acceptance with respect to its association with the bee. I speak of the double axe. Did the double axe of the Minoans depict a stylised bee / goddess? In other words, the double axes of both cultures appear to have been veiled in similar, if not identical, symbolism. This is intriguing, for DNA has revealed that the people of Çatalhöyük migrated to Minoan Crete. What’s more, the word labrys, derives from the ancient Turkish (Lydian) word for ‘double axe’, and Knossos, the capital of Minoan Crete, was known as the ‘Palace of the Double Axe’. Given that the double axe represents a stylised bee and/or goddess, this renders Knossos not the ‘Palace of the Double Axe’, but rather the ‘Palace of THE BEE (Goddess)’. This realisation also demands that we re-examine the notion of the ‘Labyrinth’ at Knossos (which I discuss in my lectures), as this word also derives from labrys. Linguistics aside, even on the most cursory of levels the bee’s significance in Knossos is hard to refute. Take, for example, the account of King Minos, whose son drowned in a vat of honey, an illuminating fact whose implications have been largely overlooked. This brings us to the assertion that the fleur-de-lis may also have represented a bee, a theory supported by many, including the French physician, antiquary and archaeologist, Jean-Jacques Chifflet. However, to understand how such an iconic symbol could represent a bee, we must first understand the bee’s importance in French culture. Napoleon Bonaparte, the famed military and political leader of France, ensured that the bee was widely adopted in his court, as well as in the clothing, draperies, carpets and furniture of the country at large. By choosing the bee as the emblem of his reign, Napoleon was paying homage to Childeric (436–481), one of the ‘long-haired’ Merovingian kings of the region known as Gaul. When Childeric’s tomb was uncovered in 1653 it was found to contain 300 golden jewels, styled in the image of a bee, and these are the same bees that Napoleon had affixed to his coronation robe. Napoleon’s choice of the bee as the national emblem of his imperial rule also spoke volumes about his desire to be associated with the Carolingians and Merovingians, the early French kings whose funerary furniture featured bee and cicada symbolism as a metaphor for resurrection and immortality. The bee was a hugely important icon of Napoleon’s reign and his obsession with its symbolism gave rise to his nickname, the Bee. The bee was also a vital symbol of French industry and one of the most prominent emblems of the French Revolution (1789–1799). In fact, Louis XII, King of France, was known as the ‘father of the pope’ and had featured a beehive in his coat of arms. And so the bee remained a prominent element of French culture throughout the First and Second Empires (1804-1814 and 1852-1870) due to the enthusiastic patronage it had previously received. Does the fleur-de-lis represent a bee? Despite the plausibility that the fleur-de-lis may symbolise the bee, I had remained skeptical of the possibility until, that is, only recently. In August 2014 I travelled to Lake Constance, an idyllic setting in the shadow of the Alps, nestled on the borders of Germany, Switzerland and Austria, to present the body of research I call the Hidden Hive of History. The day after my presentation, on my birthday, I received an unexpected present, for on the shore of Lake Constance, in Konstanz Cathedral, I found a coat of arms that visually associated the bee with the fleur-de-lis. The coat of arms, one of many in Konstanz Cathedral, depicted six beehives beneath three fleur-de-lis, complete with an entrance to the hive. It even depicted two bees on either side of the hives. Above the image is a gold crown, representing royalty, a concept that has been associated with bees for thousands of years. While many coats of arms depict bees and many, of course, depict the fleur-de-lis, this was the first time I had seen them associated in such an unambiguous fashion. 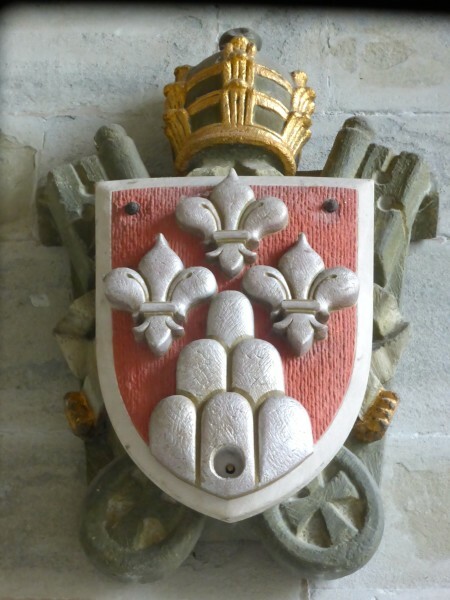 The coat of arms in Konstanz Cathedral does not prove that the fleur-de-lis symbolises the bee, but it does graphically illustrate that there exists a belief that the bee was, and still is, a vital symbol of our past, present and future. And that is worth remembering. This is the coat of arms of Pope Paul VI., 1963-1978. No beehives but rocks, on which the (catholic) church has been built. Many noble families in Rome have those rocks in their coat of arms. Sarah, hi. And thank you. Great stuff. So, I chose the observation of the coat of arms in Germany to discuss the association of the bee with the fleur-de-lis, which as you can see, I do remain skeptical about. And yes I am aware that the general image is not unique, although this particular one seemed to provide a good discussion point given its explicit representation of a bee in the context of the image. But with respect to the shape which I suggest might to be a hive, I appreciate the notion that it represents the stone or foundation that the church has been built on, in fact I like that a lot, but the association of the early church, and especially popes is explicitly tied to bee symbolism. 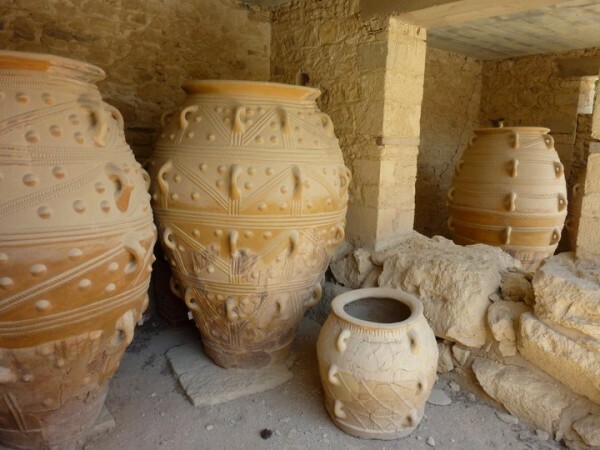 Have a look at Parts 1 and 2 of the my Bee Trilogy and if you get a chance, have a read of ‘Apiculture in the Prehistoric Aegean’. This, I feel, presents a very compelling and well rounded discussion of the shape in question. A great article and very interesting although I would have to agree with Sarah Dyrholm that the crest is an interpretation of that of Pope Paul VI. I do not think that those are bees on the emblem but in fact the fringed ends of the ornate Papal tippet either side, but naturally I have not seen it first hand so it is hard to say. I think maybe the “hive opening” could be a technical addition to prevent cracking during mounting it to the wall or to avoid using too long a pins. Either way, a great read which got me thinking and I shall certainly look into the Heretic Magazine in the future, it looks very interesting. Imogen, hi. And thank your feedback. It’s a fascinating subject. To me it seems the resemblance to beehives is definitely there. It’s the shape of these supposed rocks or stones, along with what appears to be an entrance hole, not to mention the antithetical bees flanking them. Plus there already appears to be a strong etymological and mythological connection between bees and stones anyway. The Merovingians used the bee as its prominent symbol, and this probably evolved into the familiar lily shape associated with France, until Napoleon heredoxically and briefly reverted it back again. Good work Andrew! Thanks so much Stephen. I appreciate your observations. sir you are amazing. reading this piece here..I have tied together a huge handful of loose ends!! Great discussion! I arrived here because I googled “relationship between bees and fleur de lis.” To my artist’s eye, they look like stylized bees. I am happy to discover that I am not alone in my opinion. see also Hamlets Mill for a source. Don’t forget that priestesses of Demeter in Eleusis were called “bees”. Absolutely. I write and lecture about that fact in some detail… Thanks for checking it out. This is not the first time I have heard of the association of Bees and the Fleur De Lis. I have thought that Napoleon would want to legitimize his rule by calling on the symbols of the Royalty, in some way that would not have been at first notice, but would have been ingrained in the persona of the French people. The bee would have been seen to the common man as a new symbol and not as a reference to any former dynasty, but would have been familiar to them in a comforting way. My two cents worth. Stones or Hives, they both represent structure. And yes it is a BEE! ……As in a QUEEN! Thank you for an extremely interesting read. I have just begun researching the presence of insects, particularly bees, in heraldry so was happy I came across this piece. I look forward to furthering my research and I’m sure Mr Gough’s writings will play a significant role. Thank you very much. I look forward to your research.